"Never give up." — Interview with Hannu Luntiala, part 2 - "Write now is good." Thanks for this interesting interview. I am the lucky translator who has been given a grant to produce an English excerpt from Viimeiset viestit, which I hope to complete by the end of August. As soon as I heard about the book I was intrigued, and after speaking with the publisher about it, I immediately applied for a grant to support translating an excerpt. Having just started to read the novel, I can tell you that the format works wonderfully to create a sense of acute curiosity, of peering through cracks into private mysteries. 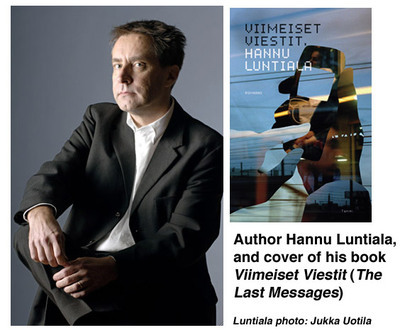 I am interested in the English translation of "The Last Messages" by Hannu Luntiala. (Review in Foreign Policy issue July/August 2007.) My interest includes (1) text message format, (2) attitude - philosophy expressed, and (3) my son, Ted Shelton's , high esteem for the Finnish people. Hi Lola — Thank you so much for the links! I'll post an update ASAP and I'll email you when it's live.